In type 1 diabetes, the immune system destroys insulin-producing cells in the pancreas, but the precise cause has not been clear. A study published by Cell Press on March 5th in Cell Metabolism reveals that a single mutation in the "longevity gene" SIRT1 can cause type 1 diabetes in humans. The findings unearth the role this gene plays in human autoimmunity and disease and also offer new avenues for treating a range of autoimmune disorders. "We describe one of the first single gene defects leading to type 1 diabetes, as well as the first human mutation in the SIRT1 gene," says senior study author Marc Donath of University Hospital Basel. "Our findings reveal a potential mechanistic basis for the development of a treatment for type 1 diabetes and other autoimmune diseases." Type 1 diabetes is a lifelong, potentially fatal disease, typically diagnosed in young individuals, in which beta cells in the pancreas do not produce enough of the hormone insulin, resulting in high levels of blood sugar. Animal studies have shown that a gene called SIRT1, which is well known for its role in promoting longevity and protecting against age-related diseases, also regulates insulin secretion and the development of autoimmune conditions, and activation of this gene can protect against type 1 diabetes. But until now, the role of SIRT1 in human autoimmunity and disease was not known. 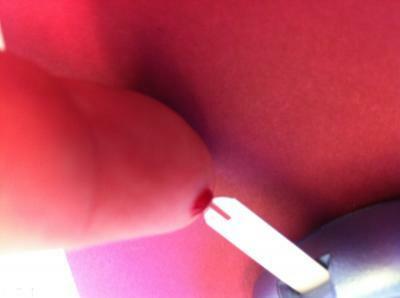 This image shows a measurement of blood glucose by a patient with type 1 diabetes following a pricking of the finger with a lancet. 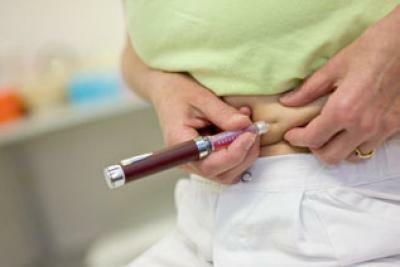 Self-monitoring of blood glucose is recommended for people with type 1 diabetes before each injection of insulin and when hypoglycemia (low blood glucose) is suspected. In the new study, Donath and his team described a family carrying a mutation in the SIRT1 gene. All five affected members developed an autoimmune disorder, and four developed type 1 diabetes. Using a combination of gene-sequencing techniques, the researchers identified a previously undocumented mutation that caused an amino acid substitution in the SIRT1 protein. Moreover, inactivation of the SIRT1 gene in mice led to the destruction of the insulin-producing region of the pancreas, resulting in high levels of blood sugar. "The identification of a gene leading to type 1 diabetes should allow us to understand the mechanism responsible for the disease and may open up new treatment options," Donath says. "To follow up on this study, we are creating a mouse that carries the mutation, with the hope of developing an animal model for human type 1 diabetes, and we are exploring the possibility of conducting a clinical study with SIRT1 activators." This image shows a patient with type 1 diabetes injecting herself with insulin. Patients with the disease have to inject insulin before each meal.